James Chaney was a local Mississippi CORE member. Mickey Schwerner was a member of Downtown CORE in New York City. Andrew Goodman was an Queens College/CUNY student. He was assigned by the Council of Federated Organizations (COFO), the group that oversaw the Freedom Summer Project, to Philadelphia which was CORE's section of the Mississippi project. 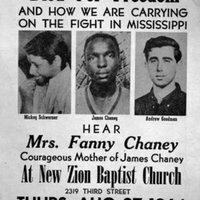 “Rally poster for murdered CORE members Schwerner, Chaney, Goodman,” corenyc.org, accessed April 21, 2019, http://www.corenyc.org/omeka/items/show/1.